Photographed on the Friday 22 July 2016. This is the Atlantic Puffin (Fratercula arctica) seen here apparantly socialising, its favourite food is Sandeels (Ammodytesspp) and may make several journeys a day to feed its young. I remember seeing these as a child on Puffin Island as it was affectionaly known which was attached to the Larger Lundy Island. 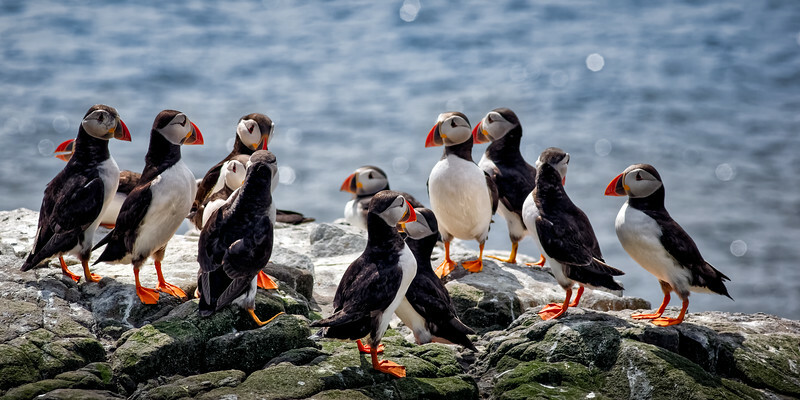 The conservation status of the Atlantic Puffin is of concern and was Red listed in ‘’Birds of Conservation Concern’’. However, in Iceland which holds most of the Atlantic population they are still hunted where they form part of the national diet and where it does not have legal protection. They can be long lived birds, living in excess of 20 years and form long term relationships. They breed in colonies and nest in burrows to which they return each year and clean ready for the new arrival. The female lays just one egg which they take in turns to incubate and feed the chick. Often known as the Sea Parrot because of their colourful bills, which they shed after the breeding season. Birds are vertebrates belonging to the Chordata and known as ‘avian dinosaurs’. There are about 9 956 species of birds in the world of which about 574 occurs in the UK. Fossil records indicate that birds are the last surviving group of dinosaurs having evolve from the theropod group of saurischian dinosaur ancestors. They are characterised by light hollow bones which contain many chambers or large air-filled cavities that was typical of the dinosaurs.